It’s been a while, hasn’t it? I have been meaning to post and show you my one completed Nine-to-Five sock that’s been done for a while and the Clapotis I started (my first! ), but I either forget about posting or think about it when I don’t have time to. Life has been a little crazy for me with a lot of recent changes, though the holidays were fairly easy and painless. It’s all the other stuff giving me trouble at the moment. I’ve been working at my new job for a while now and I’m enjoying it. It’s far less stressful than my previous job and I love my schedule (I work 4 days and have 3 days off), but I get home a little late which doesn’t leave me a lot of time to do things in the evening. I don’t really mind that, though, because it’s not like I do a whole lot at night anyhow. The weather changes have been all over the place and it keeps going from warm to snow. I think that’s been driving my body a little batty with all the changes, but what can you do? I think I’ve faired pretty well with it and I know the lack of job stress has been helping. 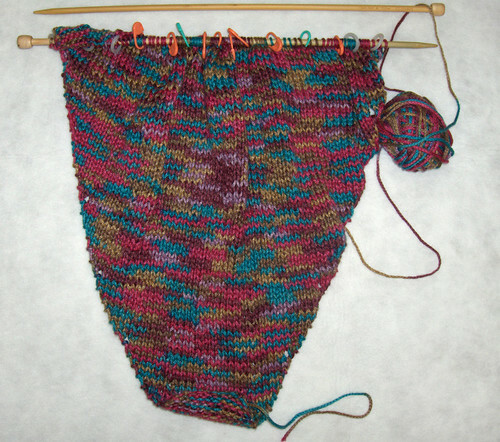 Anyhow… this is a knitting blog, so on with the knitting! The second sock has been knit up to the heel flap, so I should have a completed pair soon! I’m using Noro Lily Multi, which is discontinued. I purchased it from someone on Ravelry a while back. I absolutely love the colors and how it’s knitting up. I think it was an excellent choice for this pattern and I think it will be something I love once it’s done. I have been working on my Starlight sweater again. Not a whole lot, but I’m getting close to starting the arm hole decreases. I forgot how much I love working with the yarn! I need an updated picture of it in good light, but the weather hasn’t given me sun while I’m home in the last few days. I’m going to wait until there’s some sun to take pictures so I can properly show the color of the yarn and better show the cables. I scrapped the mittens I mentioned here because I didn’t like how they were coming out. They were a bit too tight on me. I also haven’t posted about another hat I made. Notes: None. 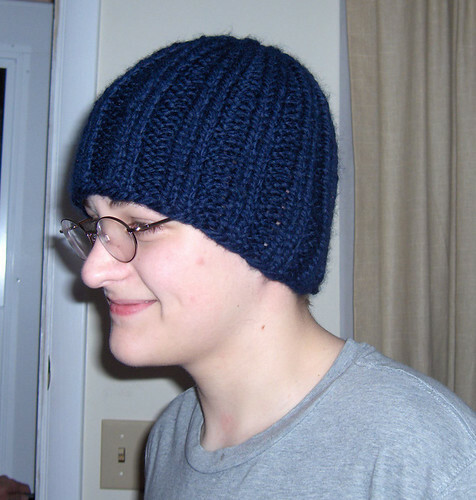 I’ve knit this hat 3 times before and it’s a really quick knit. I don’t even remember the day I started it, but I worked on it knitting a few rows here and there, completing it in about 3 days. Previous Post An FO and an update.